I'm just summing it up and giving my thoughts about it, though I encourage everyone to read it. did not give any statistics on this part. so as to inhibit the circulation of such claims in other countries." This is how they were going to take action by controlling the opposition. Taken straight from the document its self. to discourage unfounded and irresponsible speculation. using the attached Fletcher Knebel article and Spectator piece for background." disinformation and controlling opposition then I don't know what is. There is a little more evidence in this document proving it and mostly going into detail. You can read it yourself by searching "CIA document 1035-960" in Google. Here's a good watch. He talks about this topic and document a bit but as far as the creator I haven't seen many of his videos. Great video post! I am personally surrounded by brainwashed individuals, and some of these are people I love dearly. I have not shared my opinions on these truths that I believe (Flat Earth, massive propaganda in main stream media) in fear of how it would effect them (mental stability) and how they would attack my opinions, because they do have this opinion that they are smarter then myself especially if they new that I had these opinions. I truly feel like I'm in the middle of a rock and a hard place. It is certainly frustrating at times when someone says to me, I don't have the right to push my opinions on to others, but it is perfectly fine for them to push their indoctrination onto me because they see it as fact, so if I don't believe what they believe I need to go see a Psychologist or psychiatrist, which is just more BS. Finally a video about this! Wikileaks and Snowden are two of the biggest frauds this century. Good videos. I always wondered about wiki leaks. They have some crazy info that has came out but no one person has really been served for any of it. Its just helping the whole right vs. left stuff it seems. The right always uses them as like a holy grail of info. Also, while Julian Assange says he never met Anne Hamilton-Byrne, he claims his mothers boyfriend was a member of "The Family" cult here in Australia. The cult has many parallels to MK ULTRA style programmes, where children were brainwashed and given drugs such as LSD at a young age. 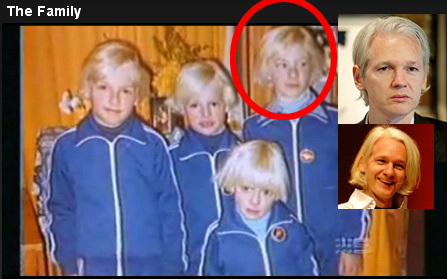 All the children in the cult dyed their hair blonde, something which Julian Assange still does to this day. Why would he do this? A bit strange right? I don't know any men who dye their hair, let alone constantly blonde. Personally, I suspect he is nothing more than a Zionist puppet programmed through an early MK ULTRA project. Their latest CIA Vault release was not ground breaking, and we already knew these intelligence agencies have been spying on us via any means possible for decades. Looks like him to me, and again, the dyed hair to this day. Hmm, very interesting.. I have always thought that Snowden was suspicious.. What he ended up releasing should have been common knowledge to everyone. Clearly people should have known their communications were being stored.. and they could listen in whenever they want.. I always thought - he risked his life for this BS.. But Assange.. I guess I never thought about that way.. I also haven't really followed much about him.. until this last election. And once again - what he did release about Hillary and the election - we already knew was happening - he just reaffirmed it. Between that and his comments about Seth Rich ...I was blinded from looking at it from the co-intel direction.. I had never thought about this angle, but it makes so much sense. I never liked assange, but snowden i kind of liked, even though I thought it was weird how the media always portrayed him as a hero for millenials, while the government hates him, yet won't do anything to get him back from Russia. It is easy to see how everything they portray on television is nothing more than fantasy and mind control. I hate i ever bought into any of their crap.